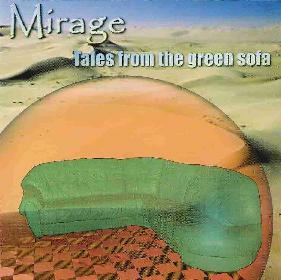 Mirage - "Tales From The Green Sofa"
The spirit of Camel, not to mention Caravan and Genesis, lives on in Mirage’s second album, Tales from the Green Sofa. Lots of melodic improvisation and harmonic inventiveness characterizes and distinguishes many of the songs on Green Sofa, particularly on the two part “Secret Place” which instantly reminds one of a clever compromise between Camel’s “Lunar Sea” and Genesis’ “Dancing with the Moonlit Knight.” Stephan Forner’s very impressive guitar soloing is clearly the focus here, though Philippe Duplessy supplies ample support with his often Tony Banks influenced synthesizer/organ embellishments. Mirage is squarely rooted in the great progressive/art rock nexus of the 70s, and one can hear distinct echoes of long departed ghosts from that halcyon era, including Renaissance, Jade Warrior, and perhaps even Pulsar. Consequently, there’s nothing blindingly original in the group’s approach. But Mirage mines the rare ores of progressive rock classics with a deft touch, often refining and enhancing elements of the genre into the sparkling equivalent of superbly polished gems. As a result, listening to Green Sofa is like stepping into a time machine, and an exhilarating voyage it is. The addition of woodwinds and string arrangements to several songs (“Friends of Mine,” for instance) only adds to strengthen the group’s diversity. And the vocals (sung in English, and very well realized, too) are surprisingly effective, showing the definite influence of John Wetton. There are even rare occasions on Green Sofa where the group rocks out (particularly on “Gone Margarita”)—a feat neither Camel nor Genesis ever seemed capable of. Fans of the artier side of rock will almost certainly revel in the techno flash and glossy hi-fi sheen of Green Sofa, though Mirage’s appeal may even cross the border into space rock and jazz-fusion territory. There’s nothing here that hasn’t been done before, but everything that’s here is done exquisitely well.